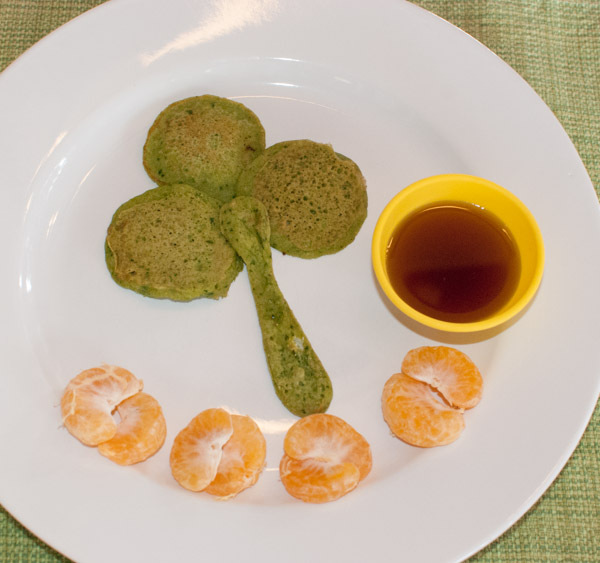 Surprise your little ones this St. Patrick’s Day with Shamrocks for breakfast. 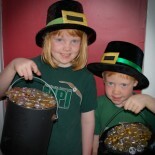 If they ask why they are green, tell them the leprechauns must have messed with the ingredients. *Make your own buttermilk by pouring 2 tablespoons of vinegar into a measuring cup, then adding milk up to the 1-cup mark. Let the mixture sit for five minutes. 1. 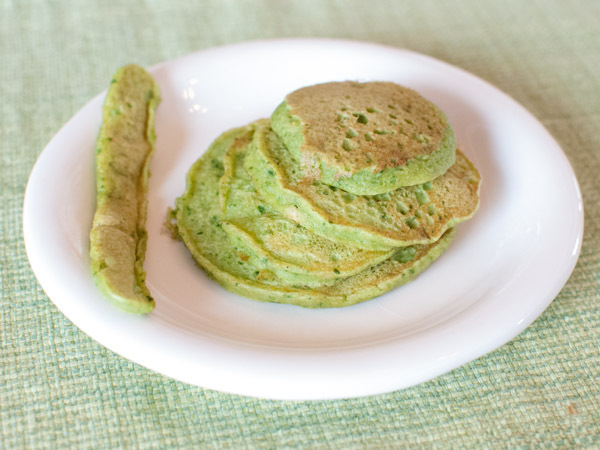 In a blender, combine spinach, buttermilk, egg and oil. Blend until smooth, 30 seconds. 2. In a separate bowl, whisk together flour, sugar, baking powder, baking soda and salt. Whisk wet ingredients into dry ingredients until just blended. 3. Grease skillet or griddle with butter or oil of choice and heat on medium. For each pancake, pour 1 tablespoon of batter onto griddle. Once you see bubbles forming on the edges, flip pancake. You want them lightly cooked and not too brown. Make a few Shamrock stems by drizzling batter in a straight line. Flip these as soon as you see bubbles forming on the edges. Arrange three pancakes and one stem on a plate. Add a pot of gold (syrup) and some fruit. Make this into a dinner treat by adding green scrambled eggs. Heat a pan on medium, add a tablespoon of water and 2 to 3 cups of baby spinach. Toss until just wilted, then pour contents into a food processor. Puree until smooth. 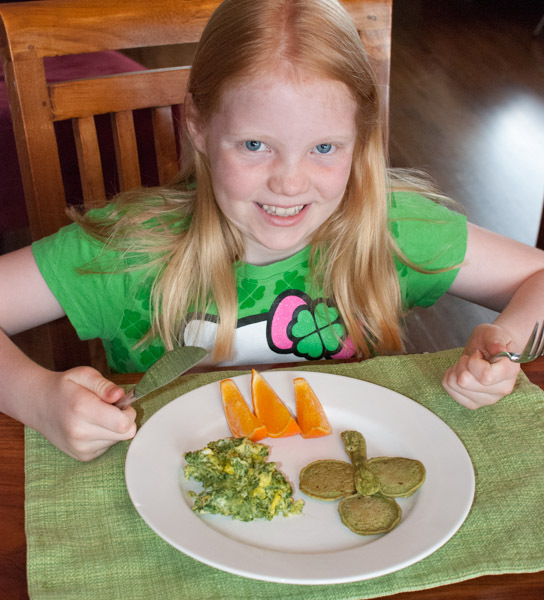 Add 1 to 2 tablespoons of spinach puree to eggs as you scramble them. You can freeze the leftover puree in ice cube trays, then pop them out and save them in freezer bags. Add the puree to pasta sauce, macaroni and cheese, or your next batch of scrambled eggs! Thanks to Parents Magazine for the recipe. 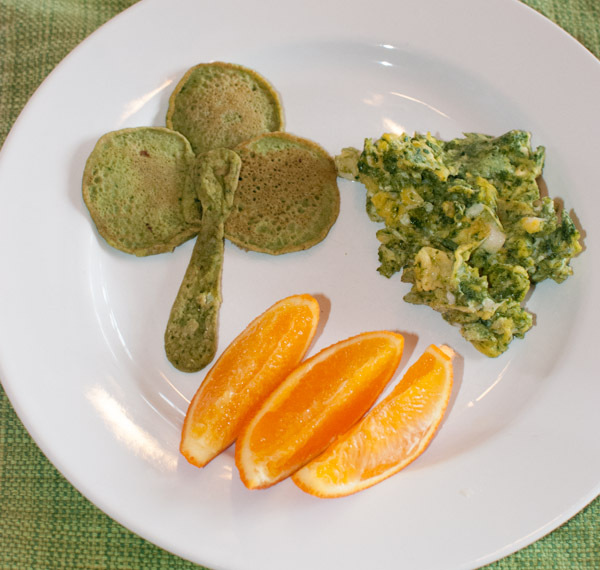 This entry was posted on March 4, 2015 by mdaucello in Elves and Leprechauns, Recipes, St. Patrick's Day and tagged breakfast, green food, leprechaun, pancake, shamrock, St. Patrick's Day.